DISCOVERY Children's Museum in Las Vegas is an extraordinary place where children can take part in a multitude of playful learning experiences. The museum features nine exhibition halls and 26,000 square feet of activities, displays, and hands-on activities as well as a regular schedule of special activities and traveling exhibits. As one reviewer states on Yelp. "This is the perfect place to take your children. They will love it and beg you to bring them back!" 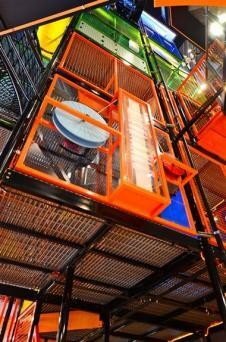 With nine exhibit galleries, DISCOVERY Children's Museum caters to children of all ages. Several regular exhibits allow children to explore regions from around the world, learn about science, and discover more about the role they play in society and in the environment. Older kids can enjoy educational activities, including acting, inventing and solving problems. Toddlers can learn and play in a special area with a crawl zone. The Summit is a 70-foot tall, 12-level tower located in the center of the building. 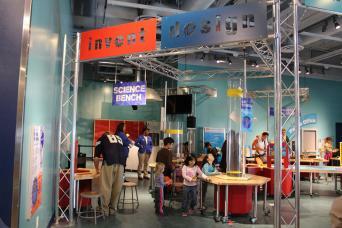 Inside, children can enjoy interactive exhibits about light, electricity, space and sound. At the top they can play on slides and a climbing frame as well as enjoy the wonderful view across Las Vegas. Fantasy Festival caters to visitors just looking for unadulterated fun. Children can create their own adventures inside a life size pirate ship and a slightly scaled down castle. Children who really enjoy role playing can don knight costumes, step onto a stage and develop their own productions. At Eco City, you and your children can learn all about the benefits of low-impact living. Along a boulevard, there are opportunities to learn about earning a living, buying groceries and building a green, eco-friendly home. At lab stations such as Drop Zone, Air Towers and Quake Proof, you and your children are invited to create, develop and test your inventions in the Patents Pending exhibit. For example, you can try your had at creating something that can withstand an earthquake or a sudden blast of air. Materials are provided at each station, and staff members are always on hand to offer assistance. Toddler Town is designed especially for visitors five years old and under. Here children can load rocks and boulders into buckets. There's also a crawl zone lined with interactive activities which will delight little ones who aren't old enough to walk. From interacting with a model of Hoover Dam to using air blowers to create currents of water, at Water World children will learn about the power and importance of water as an energy source. Don't worry about wet kids - before they go in, staff members give them waterproof smocks. The Solve It! Ancient Cities exhibit starts with a short video that introduces a problem concerning the environment. Visitors then work on solving the problem using techniques like evidence gathering, sorting, decoding and bone identification, which they can do via touch screen computers. The exhibit concludes with a discussion in the wrap up area. The Young at Art exhibit surrounds visitors with all the elements of art - color, line, shape, texture, space and form. There are stunning wall murals and creative stations where children can create their own work with, among other creative tools, water colors and fluorescent melted crayons. At the It's Your Choice exhibit, children make choices about nutrition and physical activity. The main aspect of the exhibit is a game show. Visitors are challenged to engage in healthy activities such as applying sunscreen and reading a nutrition label. The exhibit is designed to get kids focused on the long-term benefits of developing and following habits. DISCOVERY Children's Museum has traveling exhibits throughout the year. In 2016, for example, they hosted Animal Grossology, which offers a slightly different view of Fluffy, Fido, and the rest of the animal kingdom. For information on current and upcoming Traveling Exhibits, visit the Traveling Featured Exhibit page on the museum's website. The museum also offers extensive educational programs. Classroom-based: Discovery on Wheels brings the museum to the classroom. Trained educators will come to schools and use interactive activities to teach the children about health and environmental issues. The program is designed to adhere the national and local curriculum. Museum-based: The museum offers field trips for kindergarten through grade seven student groups during the school year. Summer day camps are held during the months that school is out of session. Tuesday to Friday from 9 a.m. to 4 p.m. The Discovery Museum costs $14.50 per person. For group rates please call the museum for more information. As a non-profit organization they offer free tickets to other local, non-profit entities. For information on the museum's year-long membership program, visit their membership page. The museum invites you to bring your own lunch, which you can eat out at the Symphony Park or in their snack area. The only snacks they sell are from vending machines. 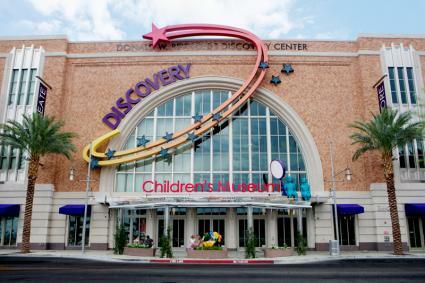 DISCOVERY Children's Museum is located at 360 Promenade Place, Las Vegas, NV 89106. 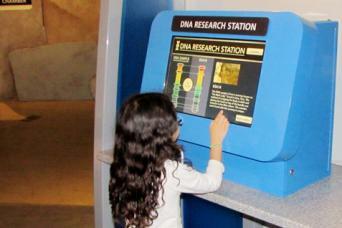 For more details about the museum, visit the website, email info@DiscoveryKidsLV.org or call (702) 382-KIDS.